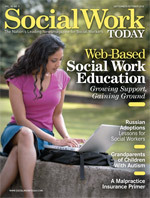 Social workers have long understood the importance of family systems in child development. A new survey reinforces that knowledge and gives grandparents of children with autism a chance to be heard. The recent release of a survey by the Interactive Autism Network (IAN) at Kennedy Krieger Institute in Baltimore can serve as a reminder to social workers to transcend the child-parent dynamic and consider grandparents when dealing with a child with autism spectrum disorder (ASD). Released in two parts, the survey is available online at www.ianproject.org. The survey is part of a larger effort, commonly known as the IAN Project, begun in 2007 by a Kennedy Krieger research team funded by Autism Speaks. ASD refers to a category of neurodevelopmental disorders with similar symptoms, such as repetitive behaviors and impaired social interaction, including deficits in verbal and nonverbal communication, that can differ according to the severity and time of onset. According to the National Institutes of Health, ASD includes autistic disorder, known as classic autism; Asperger’s syndrome; and pervasive developmental disorder not otherwise specified (PDD-NOS), known as atypical autism. The survey’s goal was to match children and families with research studies and to collect autism data from parents, according to Elise Babbitt-Welker, the Kennedy Krieger Institute’s communications manager. Indicative of their importance, grandparents rallied to be included in the survey. Most autism-related research has been medically focused, concerning causes and intervention. Studies regarding families and autism have highlighted autism’s genetic, or heritability, aspect, such as Johns Hopkins’ look at siblings with autism and the gene semaphorin 5A and the University of California, Davis’ investigation of fragile X syndrome and autism in family members of various ages. “Where there’s been less research and where this particular [IAN] study is important is in the translational aspect,” says Wall-Coté, referring to the impact of autism on families, the changing family system, the needs of families affected by autism, understanding the experiences of families affected by autism, and contextual facets of daily living such as quality of life. The survey confirms the holistic social work point of view, or the premise that a child with an illness is impacted not only by his or her nuclear family but also by the extended family and, for that matter, the child’s entire social structure. In turn, the people within the social structure are impacted by the child. More than 2,600 U.S. grandparents—83% grandmothers and 17% grandfathers—completed the IAN survey. Information about grandchildren of any age was welcomed. As it turned out, grandparents reported on grandchildren aged 1 to 44, with the largest age ranges being 4 to 7 and 8 to 12, at 45% and 32%, respectively. Because ASD is four to five times more likely to occur in males than in females, the ratio of grandsons to granddaughters covered in the study was 4.8 to 1. Of grandparents privy to their grandchild’s diagnosis, 58% who participated in the survey reported an autism diagnosis; 18% reported Asperger’s syndrome; 14% reported PDD-NOS; and 10% reported a generic ASD or PDD. If ASD was suspected but a healthcare provider had not yet officially diagnosed the child, the survey included a grandparent’s comments but excluded the data from survey graphics. In addition, grandparents with legal custody of grandchildren were excluded from survey graphics because the survey was intended to focus on grandparents who fill the traditional grandparenting role; if the grandparents merely combined households with the grandchild’s family, the information was included. The report’s introduction notes that the survey findings are preliminary and not peer reviewed. “Our philosophy at IAN is that we try to collect data quickly, and we prepare reports that are safe to give back to the community,” says Law. “By safe I mean that we stay out of in-depth statistical analysis that would require a formal peer-review process for it to be sound.” He says the next step is to examine the data in more complex ways and prepare a paper for scientific publication. Grandparents who completed the survey indicated that they have aided a grandchild with autism or the child’s family in at least one of the following ways: identifying the condition, participating in treatment decisions, providing emotional support, providing financial support, caregiving, and advocating. If it takes a village to raise a child, how much more so must it take a village—including grandparents—to raise a child with autism? Forty-nine percent of grandparents surveyed said they play a small role in treatment decisions regarding their grandchild. Twenty-one percent said they are very involved in treatment decisions, while 1% said they are completely involved or have spearheaded treatment decisions. Social workers must ensure not only that caregiving grandparents are provided with training but also that decision-making grandparents are granted access to information. “This research ensures that, as clinicians, we make sure grandparents are an integral part of the team,” notes Pinkett-Davis. The survey shows grandparents provide emotional support not only to the child with ASD but also to the parents and other children in the family. Almost 90% of grandparents, according to the study, believe they and the grandchild’s parents have grown closer as a result of facing the challenge as a team. Included in the survey are grandparents’ comments regarding helping parents cope with the situation. In fact, 57% of grandparents indicated that they worry “a great deal” about a grandchild’s parent. “From a cultural perspective, if a parent is apprehensive about the diagnosis or treatment, a grandparent is able to give them that initial nudge or extra support so the parent doesn’t feel like they’re alone,” says Pinkett-Davis. Wall-Coté, also the parent of a child with autism, notes that families affected by autism have long struggled with the challenge of paying for therapy. Fifty-seven percent of grandparents surveyed said they contribute financially to a grandchild’s autism-related needs. Twenty-five percent said they spend up to $99 monthly, while 13% spend $100 to $199 monthly, 11% spend $200 to $499 monthly, and 8% spend at least $500 monthly. Twenty-one percent indicated they have helped provide for a grandchild’s financial needs by foregoing an item or service they had wanted to purchase for themselves. Eleven percent said they “raided” their retirement funds to financially provide for a grandchild, while others borrowed money or remained employed when they could have retired. Sixty percent said they sacrificed in ways not indicated among the survey’s response choices, such as taking on additional hours at work, getting a second job, or setting up a trust fund. The survey helps broaden the myopic parent-and-child-only perspective. “If you’re not including this third generation and that financial impact, you’re missing something—a huge bunch of money being spent, sacrifices being made,” says Anderson, whose own mother is actively involved with Anderson’s son. Thirty-four percent of the grandparents who participated in the survey said they provide child care so a parent can work or go to school or because a parent is ill. Eighteen percent of grandparents surveyed said they provide transportation to school or a child’s appointments at least once per week. Pinkett-Davis puts a face on these statistics by recalling a family with whom she works. Because both parents are employed full time, the grandmother commutes from her home in North Carolina to care for her grandchild with autism in Maryland. She spends Monday through Friday with her grandchild and then drives home on weekends. Wall-Coté, who recently attended a congressional hearing in Washington, D.C., regarding adults with autism, expects autism-related political advocacy to increase. Editor’s Note: In the quotation in the sidebar’s third paragraph, the wording “the ASD grandson” and “the other grandson” and brackets “[who is neurotypical and younger]” appear as published in the report. Because autism spectrum disorder (ASD) is characterized by difficulties with verbal and nonverbal communication and sometimes by defiance and physical aggression, children with autism are often thought of as emotionally distant. However, a report recently released by the Interactive Autism Network (IAN) at the Kennedy Krieger Institute in Baltimore includes myriad anecdotes from grandparents about loving relationships between themselves and their grandchildren with autism.